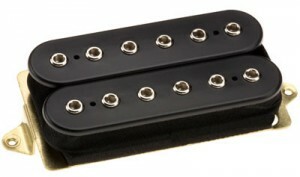 Invented independently by Joseph Raymond Butts and Seth Lover, the humbucker pickup “bucks” hum. It is ingeniously designed to passively cancel noise by having two coils with the magnetic poles reversed (i.e. the first coil has its north at the top while the other coil has its north at the bottom) and with the coils wound in opposite directions (one clockwise and the other counterclockwise). By connecting the coils together either in series (typical) or parallel, the common mode signals (signals common to both input coils —the noise) end up 180° out of phase and cancel out. The coils can either be placed side by side (typical) or stacked (to fit single-coil guitars such as the Fender Stratocaster). We are currently using single-coils in floating differential mode in the Six Pack Project. The coils are connected to the + and – inputs of the differential amplifier without any direct path to ground. This configuration is inherently noise canceling. Should we be using double coils in humbucking configuration instead to get even better noise cancellation? Humbuckers are far from perfect. To get good CMRR (Common Mode Rejection Ratio —the ability of a device to reject the common-mode noise), you need to have good matching of the coils and that is very difficult to achieve. The tolerance can go as high as 10%-20%. Differential Op Amps, on the other hand, have very good CMRR. The CMRR is limited by the matching of the resistors and you can get matched 1% or even laser-trimmed 0.1% resistors. For the subsequent tests (below), I use 1% matched resistors. 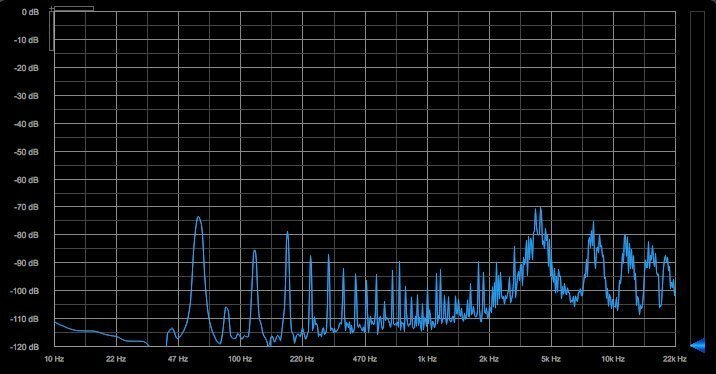 The FFT graphs below were taken from the Fender Stratocaster, the Gibson Les Paul and the Hex Pickup, while the strings are damped, to reveal the noise floor. In these tests, the Fender Stratocaster and the Gibson Les Paul go single-ended through the high-impedance input of the audio interface (as intended) while the hex pickup goes through the balanced input (again as intended) making sure that the gain of both inputs are properly calibrated at the same level prior to testing using a reference signal (1Khz sine). I am touching the bridge or strings of the Strat and LP to keep the noise down, but the hex pickup is left alone “no hands”. The first graph is the noisy single coil. 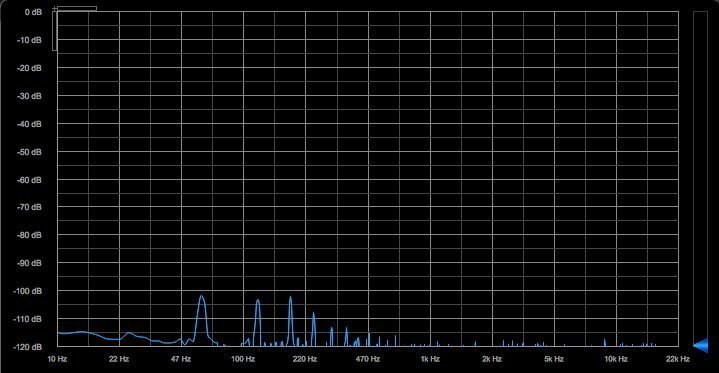 The nasty peaks are the 60 Hz harmonics and there are some bad EMI starting from 3 kHz as well (the shop where we tested is quite a noisy environment). The second graph is the Les Paul. It is a lot better than the Stratocaster of course, but it is not perfect. The noise is still very present. The third graph is the hex pickup using the LME49726 Op Amp with input noise specified as 15 nV/√Hz at 1kHz (6.9 nV/√Hz at 100kHz). You can see how silent it is compared to the first two. There’s still the 60 Hz and its harmonics but the levels are vanishingly low. 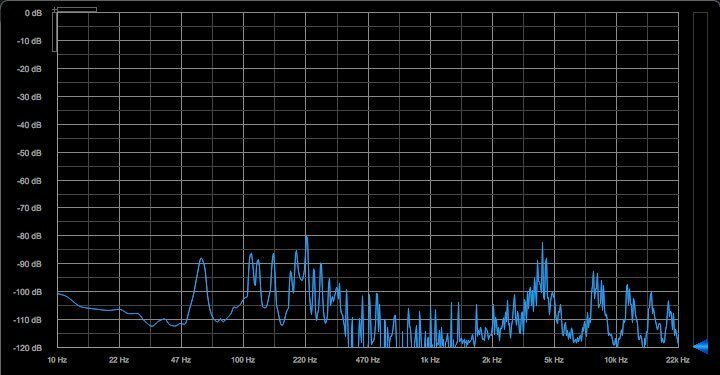 EMI is totally obliterated (what you see there is the self noise of the Op Amp which increases with frequency — I can see that same noise with the inputs shorted). Will the use of double coils make it even better? Perhaps. It may well be that the noise we see in the humbucker graph is mostly from the wiring since Les Pauls have single-ended outputs and this article on Balanced Guitar Wiring shows that balanced wiring on a standard electric guitar can give a lot of improvement. I could certainly try to find out, but I am already quite happy with the noise level of the current design and a double coil design (either side-by-side or stacked) will complicate the design. Are there alternatives? One easy idea is to take advantage of the multiple coils and have the coils alternate from north-south pole orientation, clockwise winding for the 1st, 3rd and 5th coils and south-north pole orientation, counterclockwise winding for the 2nd, 4th and 6th coils. That way, the sum of the pickup outputs will cancel some more of the noise the same way humbuckers do. Another cool idea is to wire the pickup in a bifilar coil configuration where two coils are wound at the same time (from two magnet-wire spools). The center tap connects to the start of one coil with the end of the other. The center tap is then connected to ground (or for single supplies, a voltage reference halfway between V+ and ground). The two coils, now in series, then connect to + and – inputs of the differential amplifier. What’s really neat about the bifilar coil is that the coils are always perfectly matched! The opposing fields are always perfectly balanced since the magnet-wire pairs are always in close proximity, and you always end up with the exact number of turns. Another approach I've seen with the Dual-coil set-up is to tap the connection of "north" from one coil and "south" of the other, and then run the into a differential amplifier, like balanced mic output. Hmmm, but that would combine the outputs of 2 coils, wouldn't it? What am I missing? Basically yes. The difference would be two coils in series or parallel going into a regular amp — basically traditional set-up. The other approach would have Vs1+, Vs1-/Vs2+ and Vs2- as three inputs into a balanced-mic style amp. Now that I think about this more, that's more applicable as an "improvement" in a basically traditional set-up, because you're trying to remove line noise induced by the long cable. Since you're looking at putting the pre-amp almost immediately after the pick-up, the aspects of the balanced input might not be worth the effort. How much 60-cycle noise do you get with your single coil into a differential amp? Oh, you'll be amazed! 🙂 I'll have more on that soon. I've already got you in my circles. I'm always unsure about replying to the "new to me" post or the original thread that's being referenced. Where would you rather collect this? The comment system here is severely limited. I can't even do a threaded reply to your latest comment (the depth is exceeded). I can add a better word press extension, but I can't find anything that's really good. So, yes, I'd really prefer to have discussions in the G+ forum. Just a quick note. I have found just the use of a wireless set up seems to reduce the noise a lot. This would see to indicate that much of the noise comes from grounding? Ya, floating the PU and preamp seems to have much the same effect as balancing. Yep. Well floating the PU and preamp is just another form of balancing, this time using active electronics.